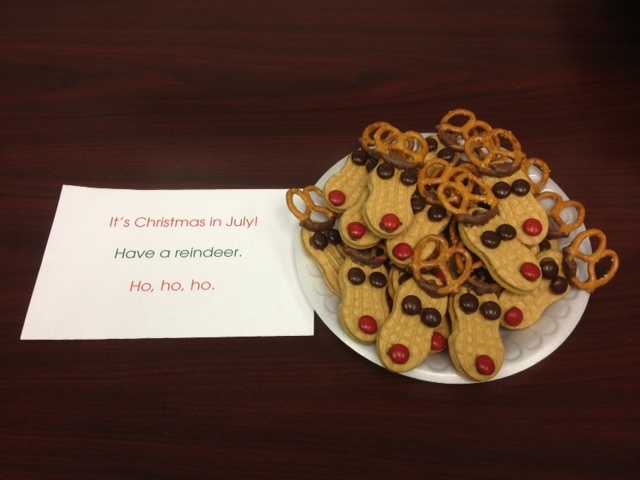 Today seemed like a good day to celebrate Christmas in July. I didn’t overdo it, just some simple Reindeer Nutter Butter cookies. Super cute and yummy. Hope they are a big hit. perfect for a random Thursday in July. At least it’s not 98 degrees (lol) already. The band, or the temperature. Ugh to both of those. Of course I stole this idea from Pinterest. 🙂 Too cute to pass up.